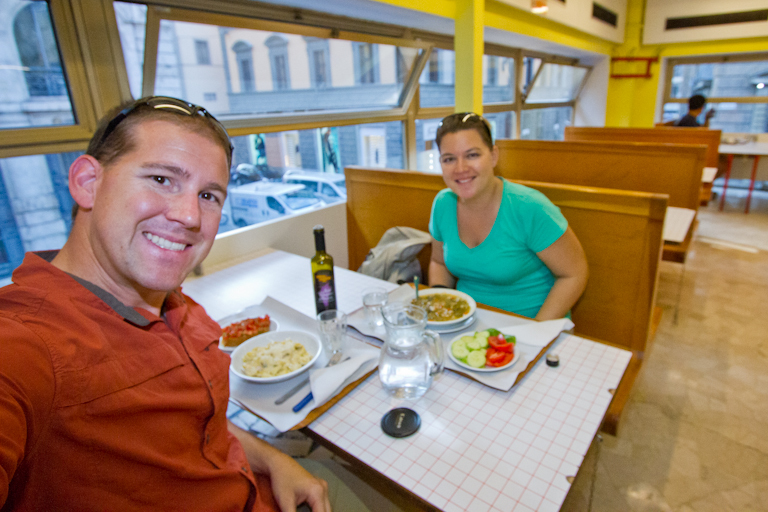 Well I got a bit busy and we've done quite a few things since the last time I wrote up our Italy/France visit. Time to restart those. The room gets pretty nice and dark. Going to sleep, we were hearing some banging around on the floors above us, so we both got ear plugs. Combine that with the sound machine and a dark room and we both slept until 10:30am. 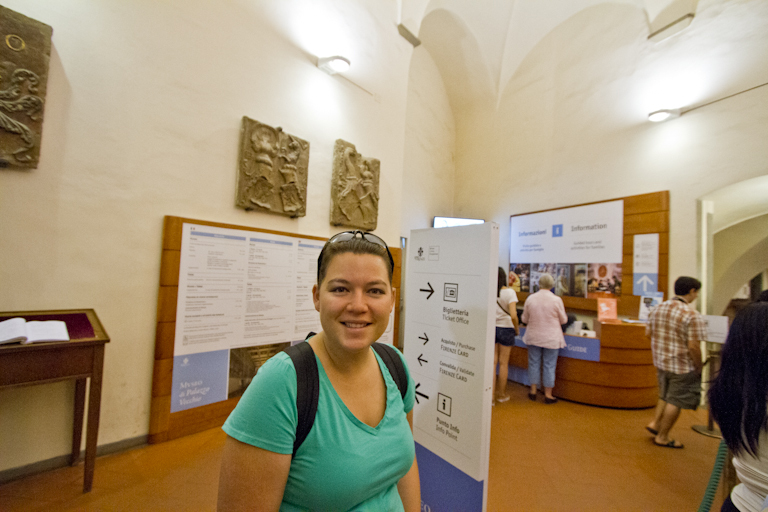 We got everything ready for the day and left for the Palazzo Vecchio. Here's where we ended up going today. Pretty much stayed in a small area. 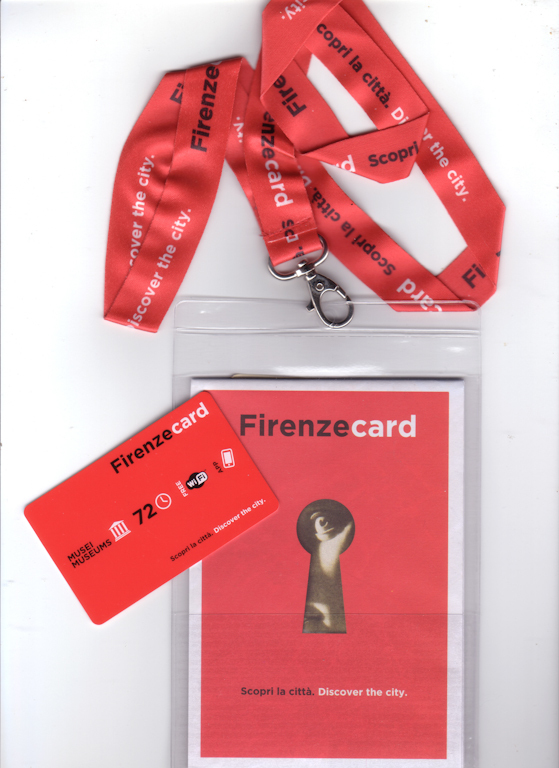 We aren’t planning on seeing it until tomorrow, but it’s a good place to pick up the Firenze card. 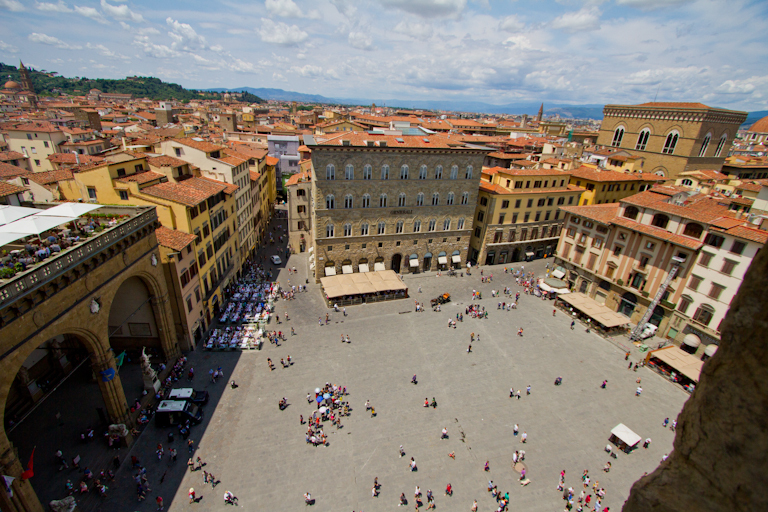 For 50 Euro each, it gets us in free to over 70 different places around Florence. We’ll only be hitting the highlights of course, but still, it’s a good deal. Not only that, but it also gets you into the reserved ticket lines, which can save a bunch of waiting around time at each stop. We got to the window to buy our tickets and bought them no problem. We were told we could activate them at the counter just behind us. It sounded like a good thing to do, so we did. 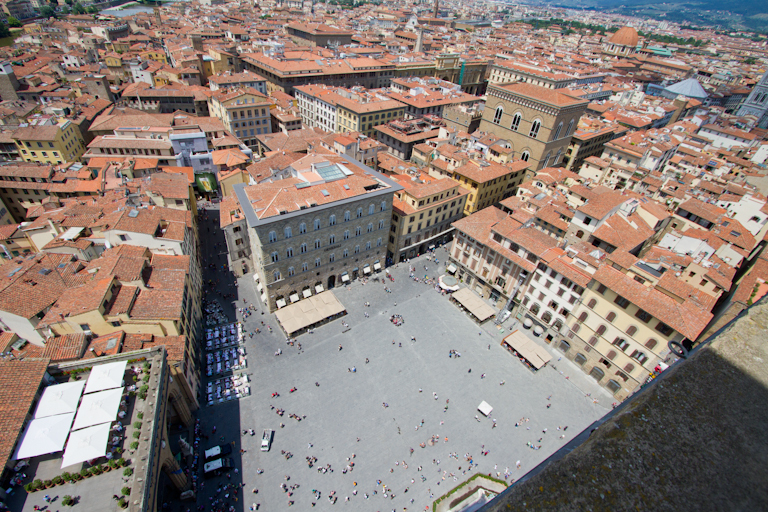 It was then they told us that we now have to go see the Palazzo Vecchio today and that we can’t come back another time. Ummm… Bummer, I guess we shouldn’t have activated them here after all. Good thing our plans are pretty flexible. We changed all of tomorrow’s plans to today, and decided to flip-flop the days. 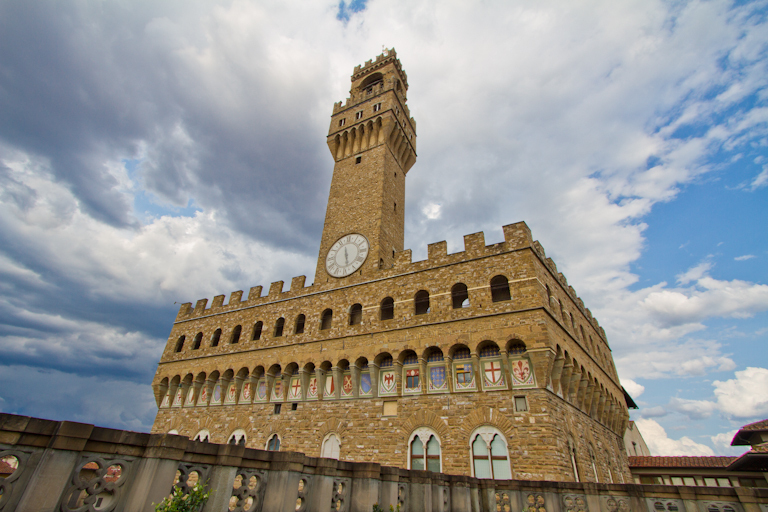 Sadly the Palazzo Vecchio closes at 2pm on Thursdays instead of 9pm like most other days. Guess we’re going to have to see everything quick since it’s already 12:15pm. T had to check her backpack since apparently those aren’t allowed but camera bags that are just as large are. Go figure. 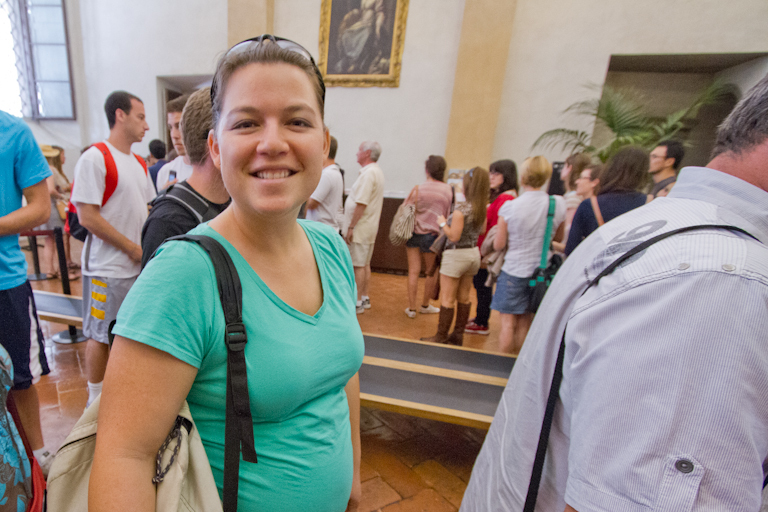 Walking up the main stairs, we come to a huge hallway lines with lots of statues of one of my favorites, Hercules! It shows lots of his Labors all around the room. 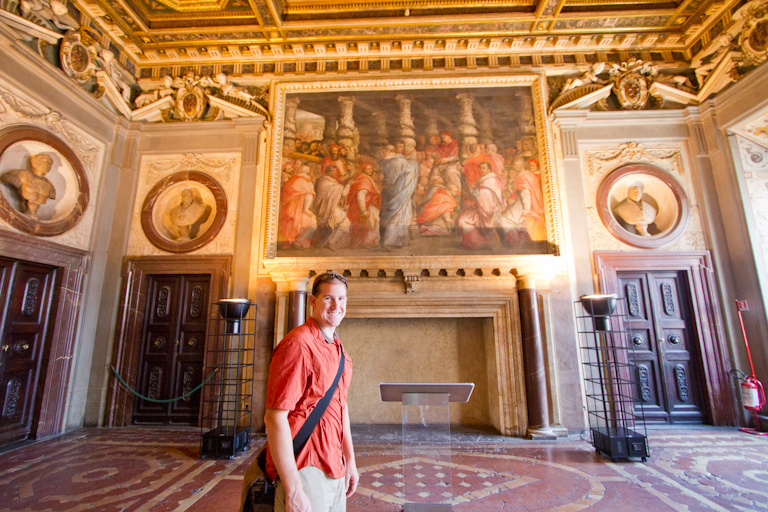 The rest of the palace was lots of decorated rooms with fancy paintings and statues. 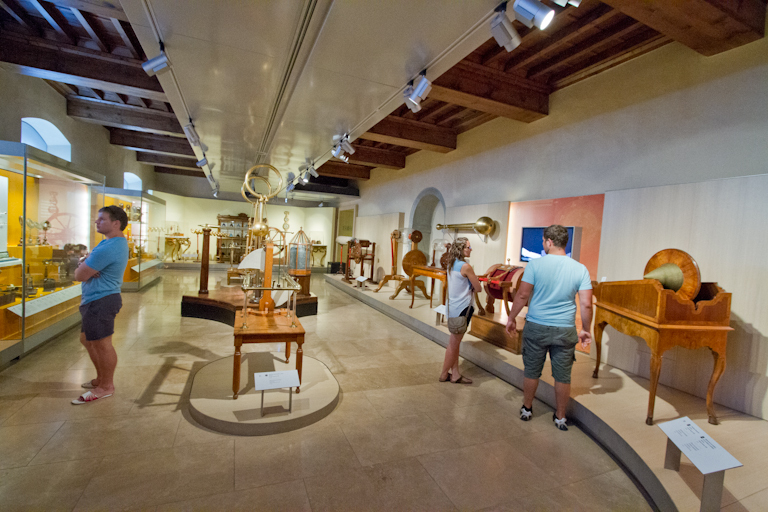 They even had a Hercules room with paintings of some of his labors and a bust. The map room was interesting. 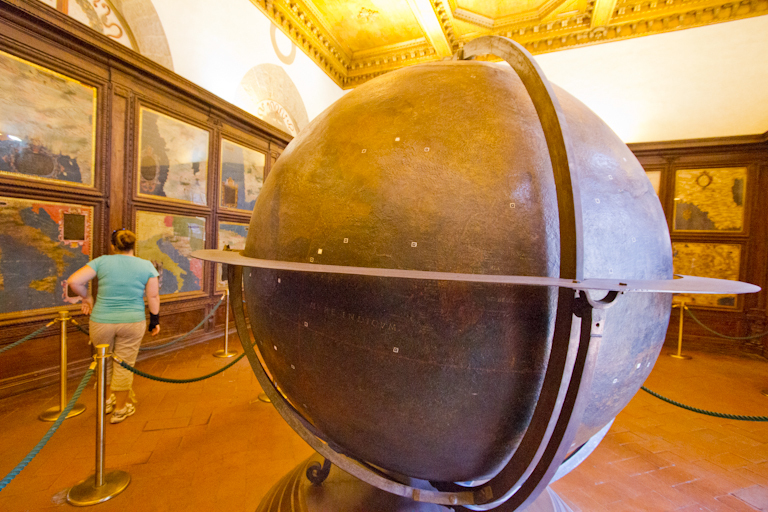 It had a giant globe in the center and maps on the walls corresponding to numbers on the globe, showing more detail. Exiting this, we had the option to either go up to the bell tower or down to the exit. 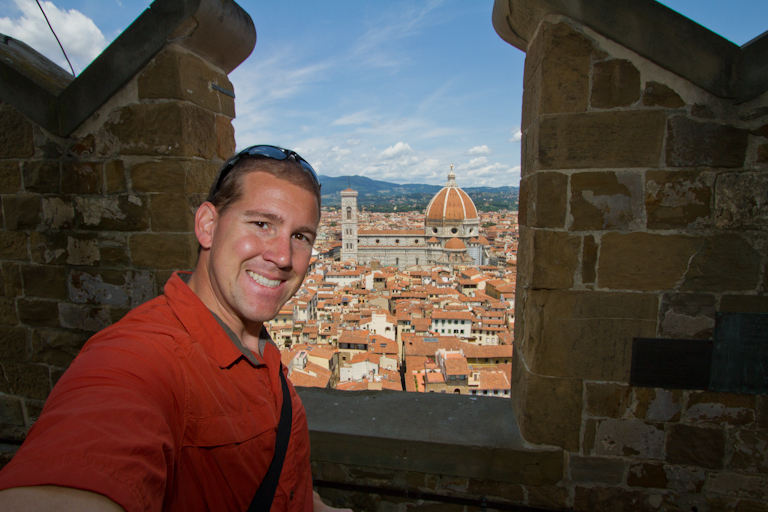 Surprisingly, Theresa said she’d walk up the stairs to the bell tower with me. I ran ahead to see how many stairs we were really talking about, and saw there was a lower level with a nice breeze and good views of the city. The museum attendant was probably wondering what I was doing when I came out of the stairwell looked around for 2 seconds then headed right back down. 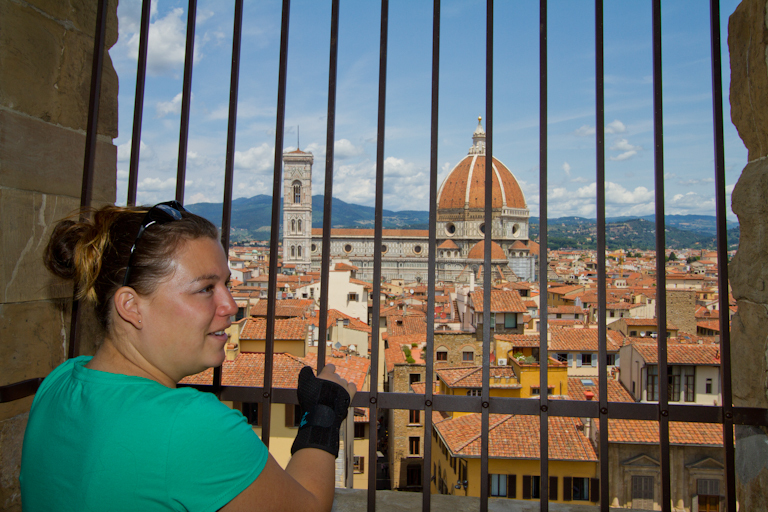 I told T it was only 2 stairwells of maybe 25 steps each and that it’s a good view, so up she came. Now the attendant figured out what I was doing when T came out of the stairwell ahead of me. He motioned that she should wait here and not continue climbing to the top. T agreed. Here's the view from the mid-level. We walked around the mid-level, then T found a nice spot to sit in the shade while I went up to the top. At 310 feet above the ground, the views up here are fairly nice, though they have the area roped off so you can’t quite see over the railings. Here's the view from the very top, stretching my arm over the edge. You can't get all that close to it otherwise. 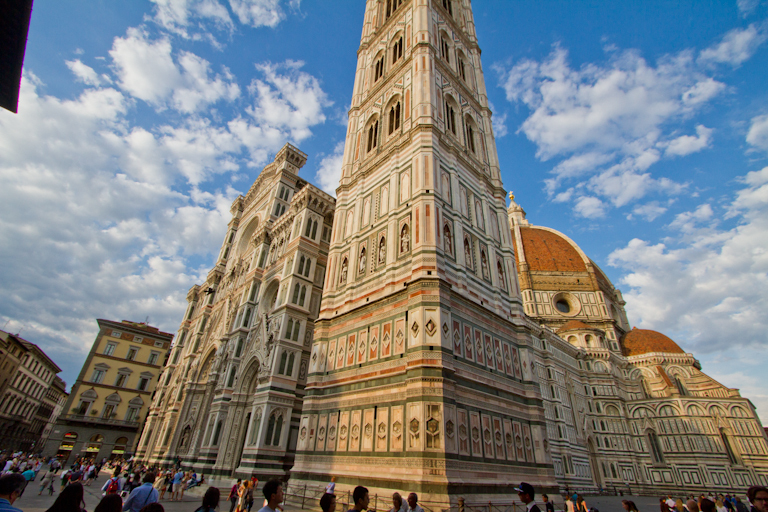 There was one side though that had a small staircase set away from the side so you can look towards the Duomo without an obstructed view. After a few minutes, I was on my way back down. Time for a very late lunch. 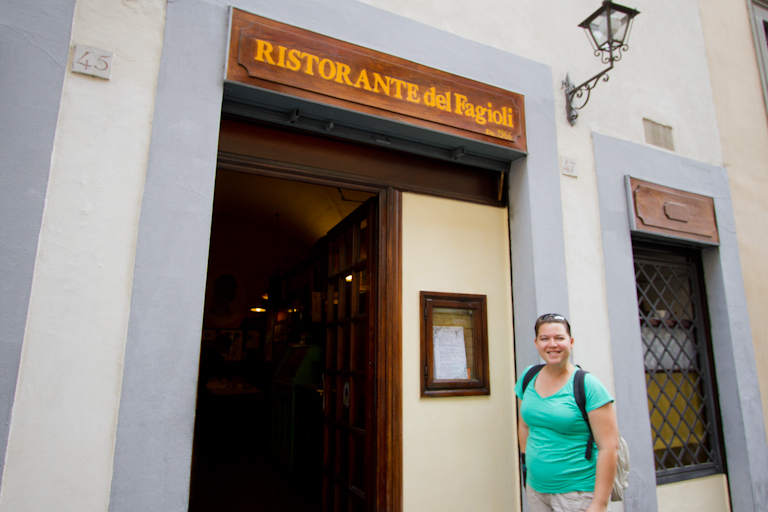 We walked over to the Osteria that is rated #3 for all restaurants on TripAdvisor and also highly in RS guide. Seeing as how they only have 16 tables, they were completely full. I asked about reservations for tonight: full. Tomorrow? Full. What about Saturday lunch? Does 2pm work? I guess it will have to. I’m hoping when we go here on Saturday this food just blows us away. Our backup was to go to the other restaurant we tried to go to last night but reservations were needed. Ristoranti del Fagioli. We walked up expecting to ask if reservations were available for tonight, but were surprised when they said they could seat us now for lunch. Yes please! 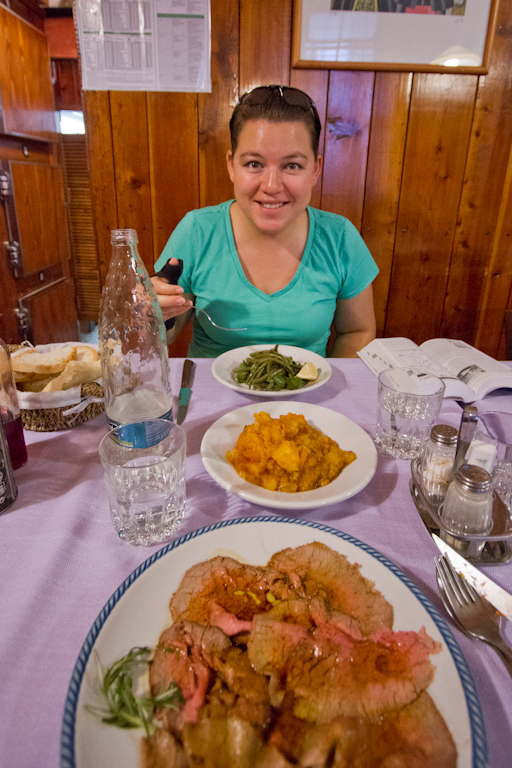 We headed to a back table and were given a menu in Italian. When the waiter came to take our orders, T waved at the menu, shrugged her shoulders and said, I don’t know. 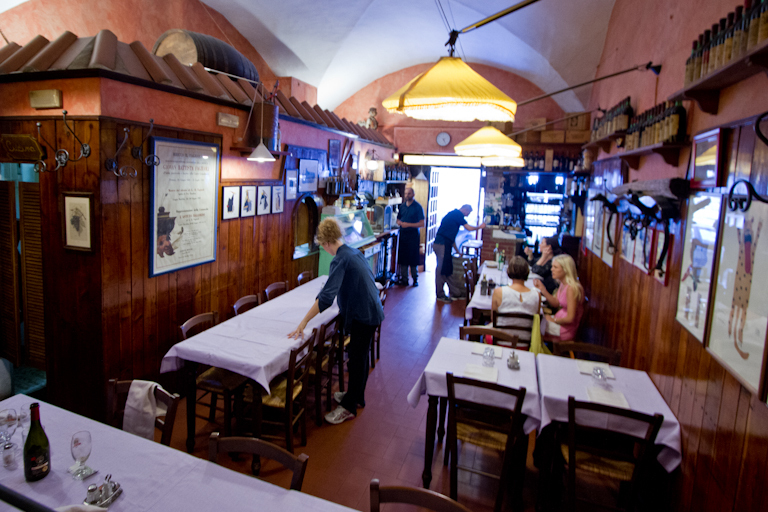 We had a great waiter though and he explained all the sections, telling us their best items and what was real Tuscan food. T decided on a tomato bread soup, green beans and potatoes. I ordered bruschetta (seeing a trend now aren’t you?) and roast beef. After the waiter left, T told me she had seen the roast beef on the way in, and they were thin slices about the size of lunchmeat. I flagged down another waiter and asked also for a side of ravioli. 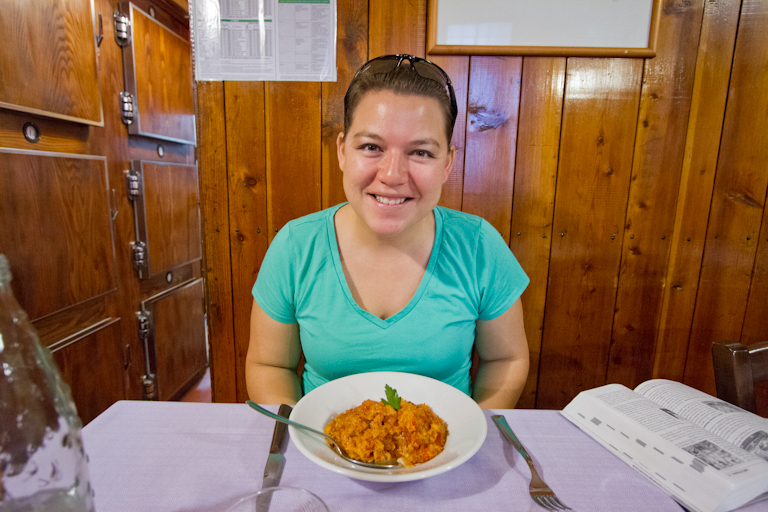 The starters came and we were both pleasantly surprised. T’s bread soup was so thick I stole a few bites with my fork. It had really good flavor. The bruschetta had ripe tomatoes on good bread. 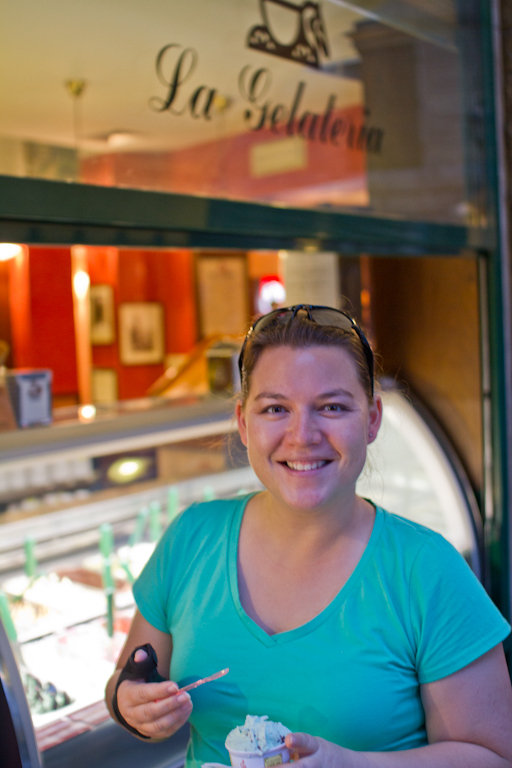 I asked about balsamic, and they said it’s not typical in Tuscan food, so they didn’t have any. It was still good though. Next came the pasta. The raviolis were stuffed with ricotta seasoned with lemon. It sounded good when he described it, and it was delicious. 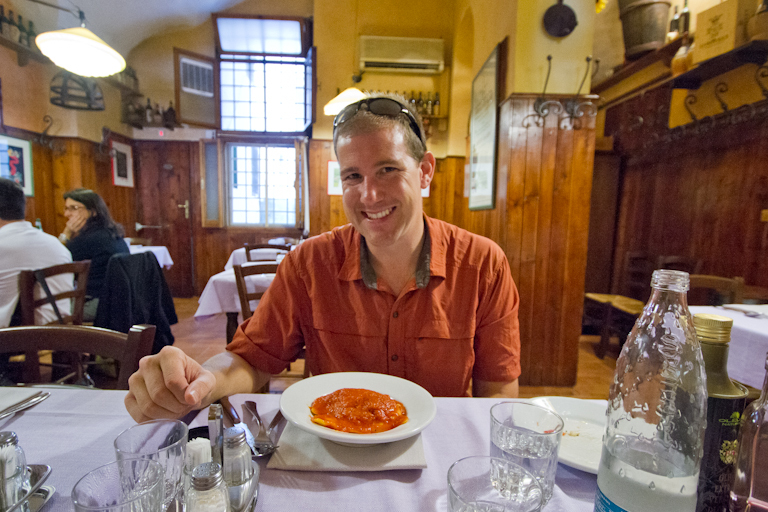 Probably the best pasta I’ve had on this trip. Next came the main courses. My thin roast beef plate and Theresa’s green beans and potatoes. Mine had good flavor and T even liked it (protein! Who’d have guessed). Her string beans were good, but they didn’t remove the string, so she was left spitting those out every once in a while. The potatoes were also really tasty. In all, it was a great meal and we had a good waiter. 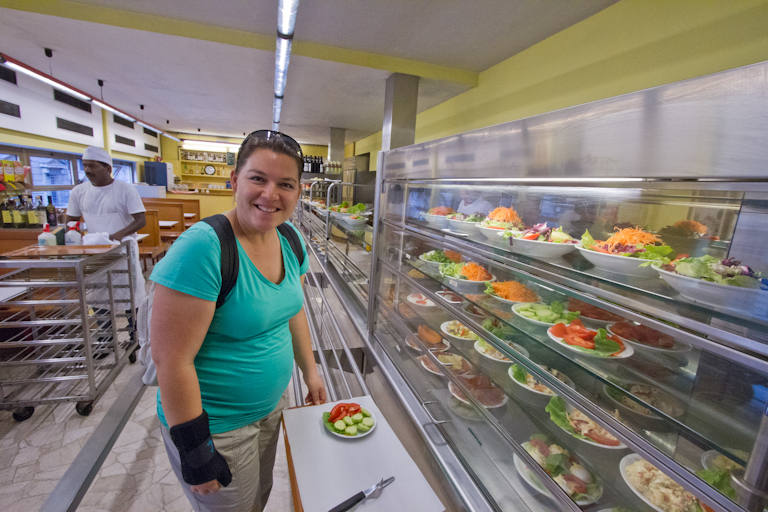 1.50 Euro cover each, 1.50 for water, 4 for bruschetta, 12 for roast beef, 9 for soup, 6 for ravioli, 5.50 for green beans and 5.50 for potatoes. Total was 46.50 Euro and we left a 50 for the best meal we’ve had since we’ve been here. 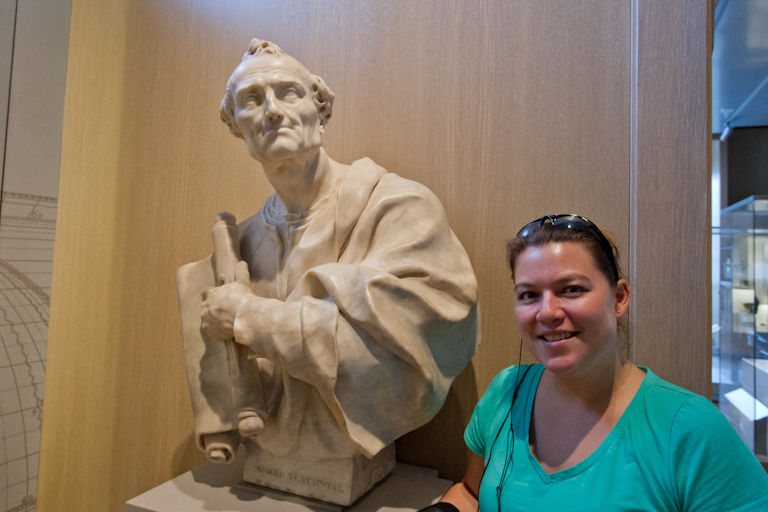 After lunch, we walked the back streets to the Galileo museum. 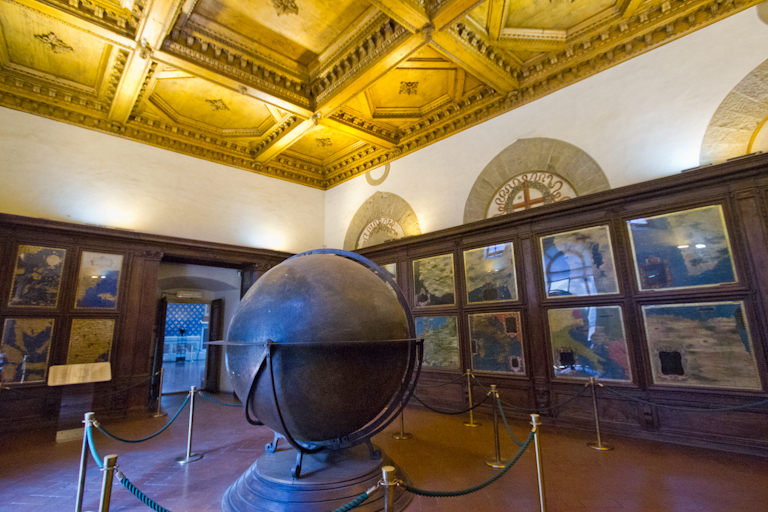 It’s one of those places where you might go if you were really interested in Galileo or astronomy I guess, but not as a main destination. 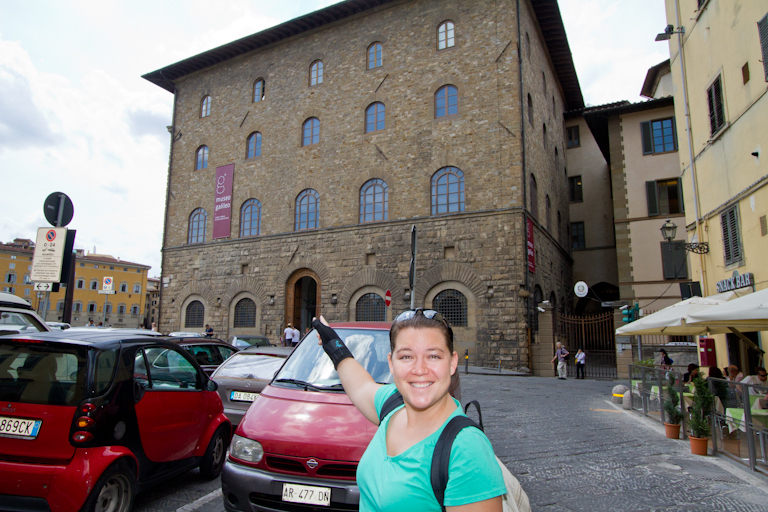 It’s free with the Firenze card though, so we swung by. The RS guide suggested to get the audio guide here so we did. The first one we got was broken, so after hiking up to the first floor, I hiked back down to replace it. We did not like this audio guide at all though. First off, it’s location specific and doesn’t always know where you are. Each room could have 5-6 zones and there are 5-6 item “1” in the room. What a horrible system. Combine that with a touchpad that, as Theresa put it “is the reason no one liked touchpads before the ipad” and it was a terrible system. After the 2nd room, we just put it away. 5 Euro wasted. The exhibits themselves were somewhat interesting. The first ones were about navigation, which while very mathematical doesn’t interest me much. 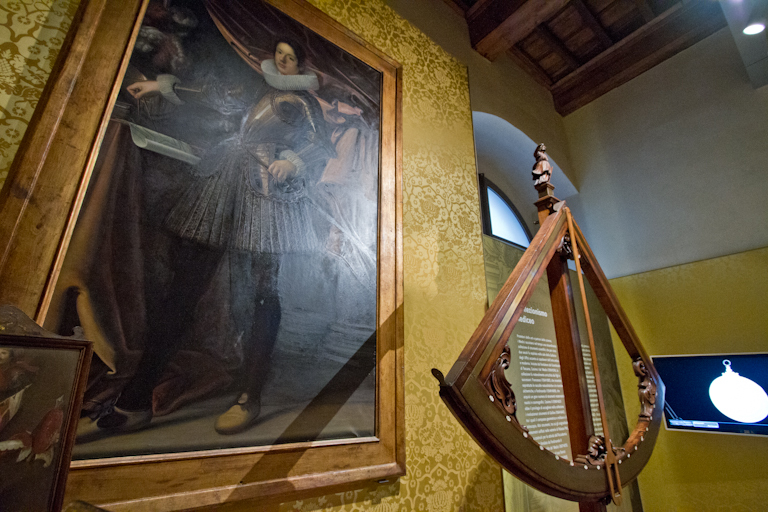 Sextants, octants, etc. 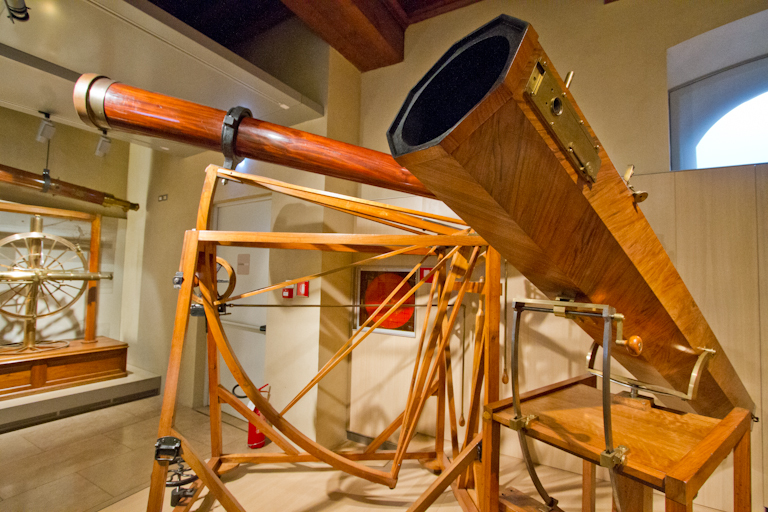 Moving on to the telescopes, it was interesting to see some of the larger ones. 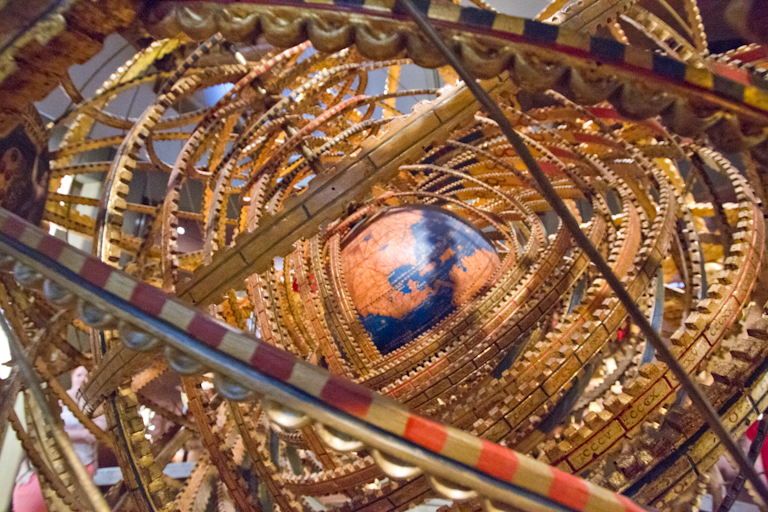 The giant earth globe surrounded by rings was another interesting piece. 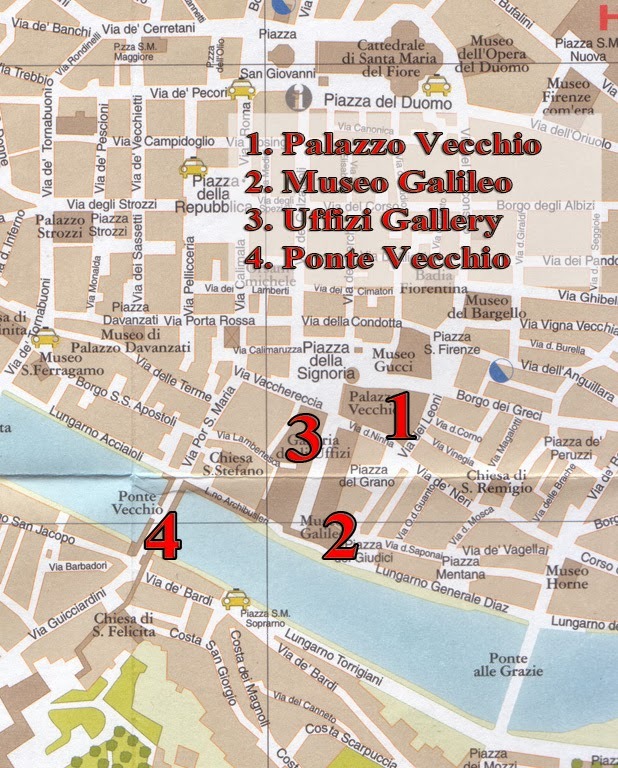 Around the map area was Amerigo Vespuci. T got her picture with him. 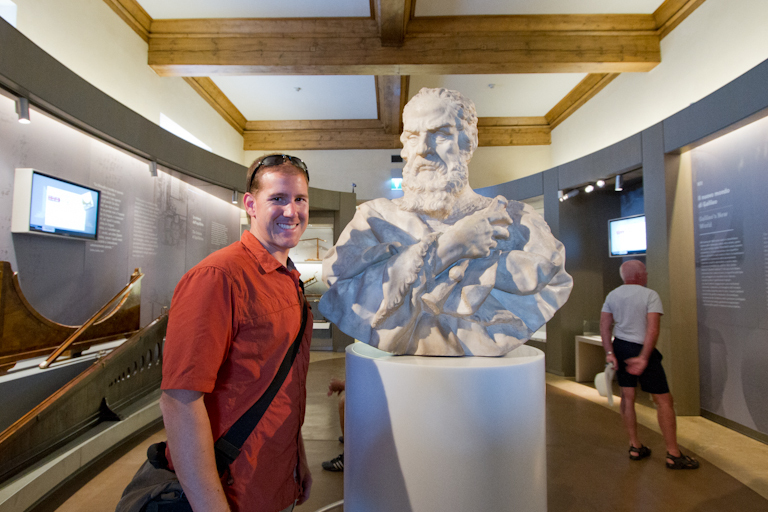 And me with a bust of Galileo. 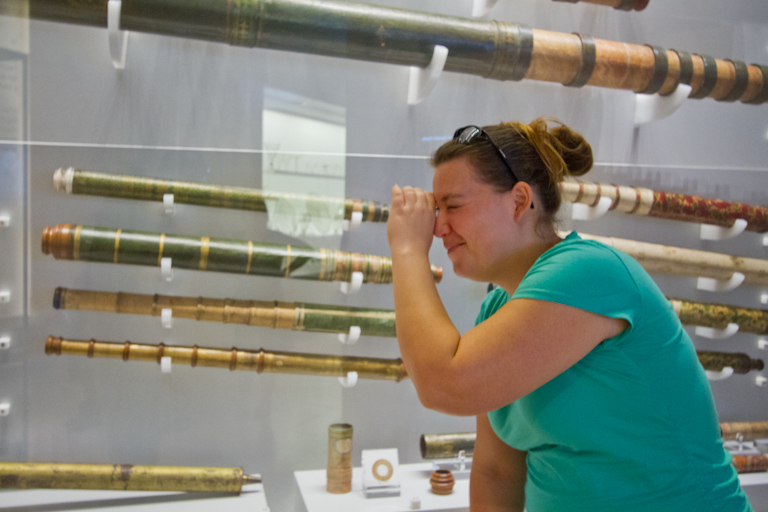 T in front of a telescope display. 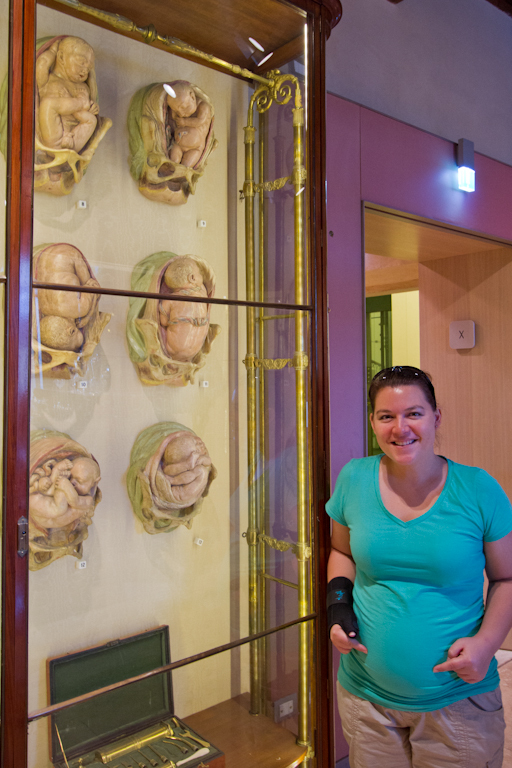 There was a display showing models of babies in a womb. T said "I have one of those!" Later though we got to the more mechanical and engineering side of the inventions. Items like the paradox machine that appears to roll uphill. Or the static electricity generator that produces sparks big enough to set off gunpowder. There were some interesting videos on the walls showing how the various experiments worked, like the water screw, electro-magnet, engine, etc. T said they must have an amazing gift shop with all the cool toys we’re seeing. We finished the tour around 4pm. 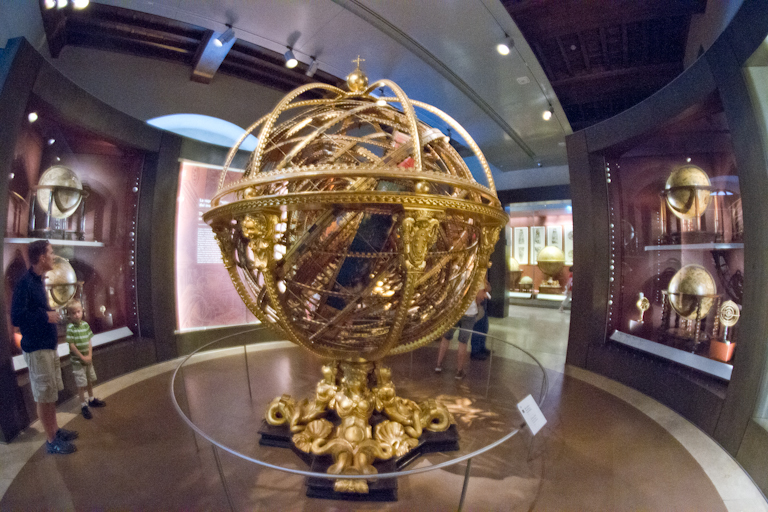 I guess I missed the room with Galileo’s finger in it. We walked through the gift shop and wow, what a missed opportunity here. No telescopes, science toys, or anything that would be cool to simulate what we just saw. 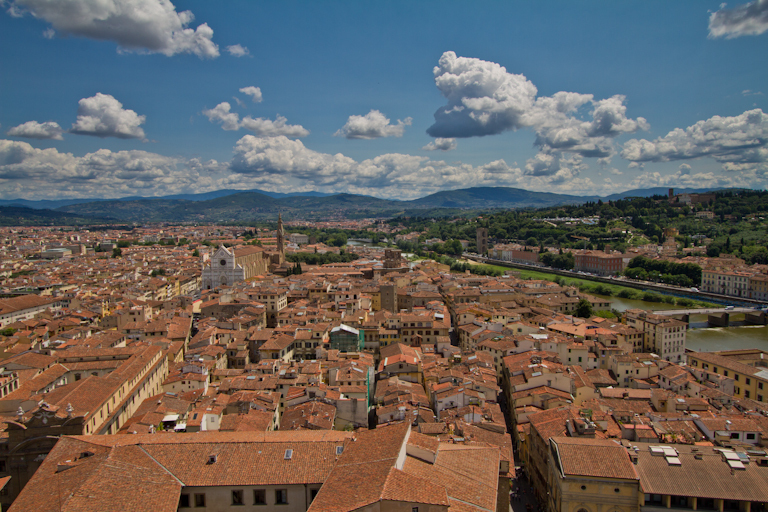 Just the typical books, postcards, pens, and generic Firenze stuff. Heading onward! machine and metal detector, Theresa got her very first “are you pregnant?” from the security lady. Something like pointing at her stomach and saying “bambino?” Saying yes, T was allowed to walk around the outside of the detector. We waited in a brief line to get in, then once inside saw there was an elevator that would take us to the top floor. No photos are allowed in here. That’s unfortunate because there’s some interesting things. 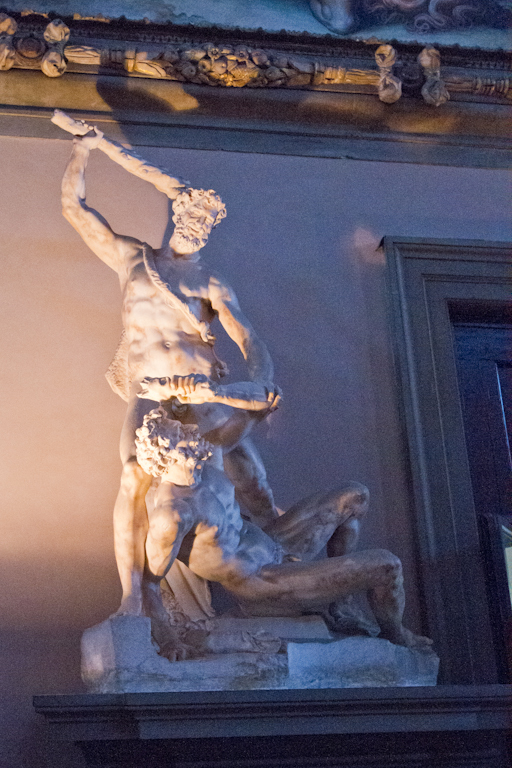 We saw interesting statues of Hercules battling a centaur. Then we saw how art progressed in style. Starting with flat 2D paintings with sense of scale. As we progressed, we see a development of styles, and how the art is progressing. Finally we get into the masters who can paint realism and make it look just like a picture. 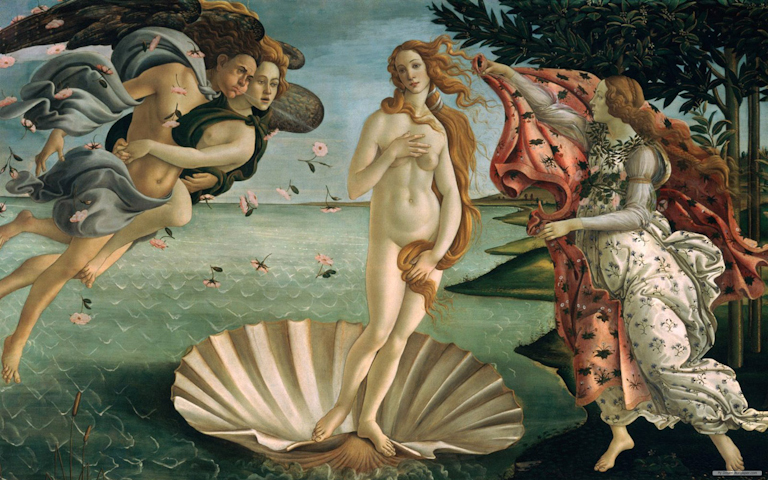 My favorite work is Boticelli’s Birth of Venus. I don’t know why, but I’m drawn to it. 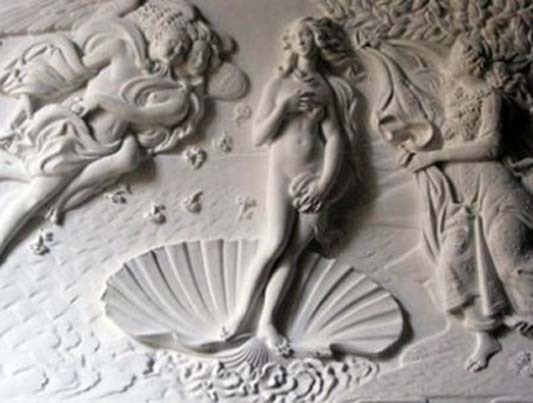 Next to the painting, is a plaster mold of what the painting would look like in 3D meant for a blind person. I wonder how many blind people are interested in coming to museums though where they can’t touch or see anything. T and I felt the display, but there were just too many different textures to get a feel for what we were seeing. We’ve been lucky and there’ve been a few places to sit in these rooms, so T has been somewhat comfortable. We’ll listen to what the guide says about the room, then I’ll get up and see the paintings closer up. If T is really interested, she’ll join me, then we continue. They didn't mind you taking pictures out the window towards the bridge. 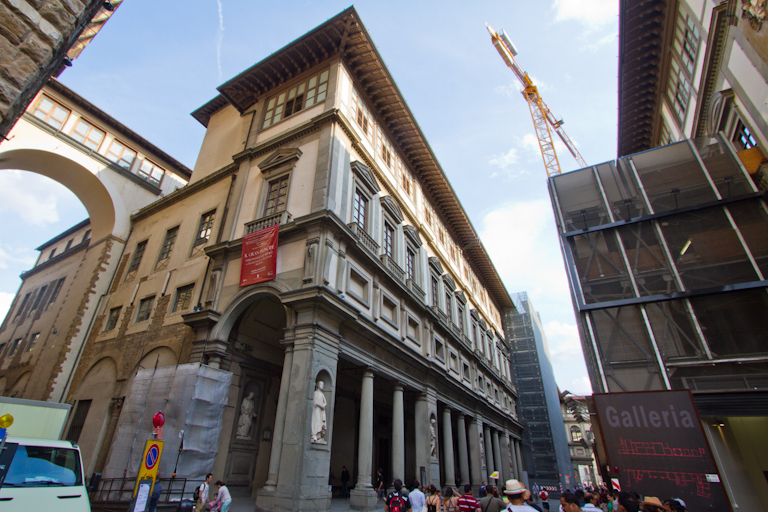 The only disappointment was that there was quite a bit of the Uffizi 2nd level closed. We exited the 2nd level to the rooftop to the cafeteria seating. I had seen this area before from the bell tower and was wondering how you got up here. 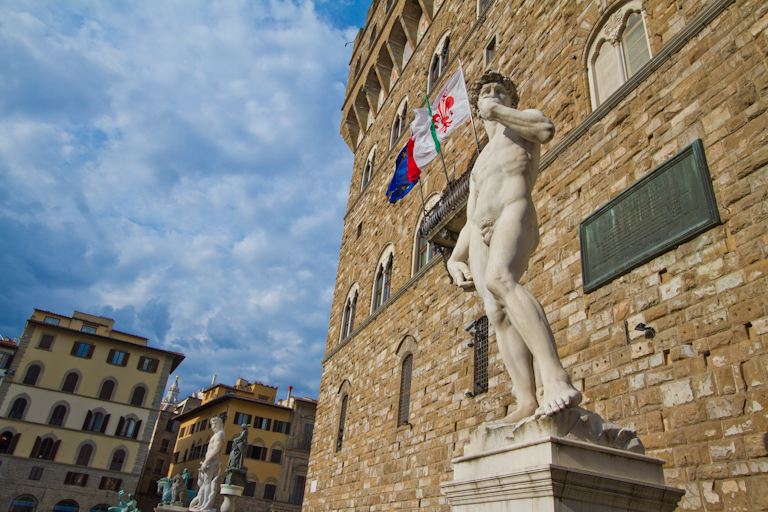 It is directly over the statues of the Palazzo de Signoria. 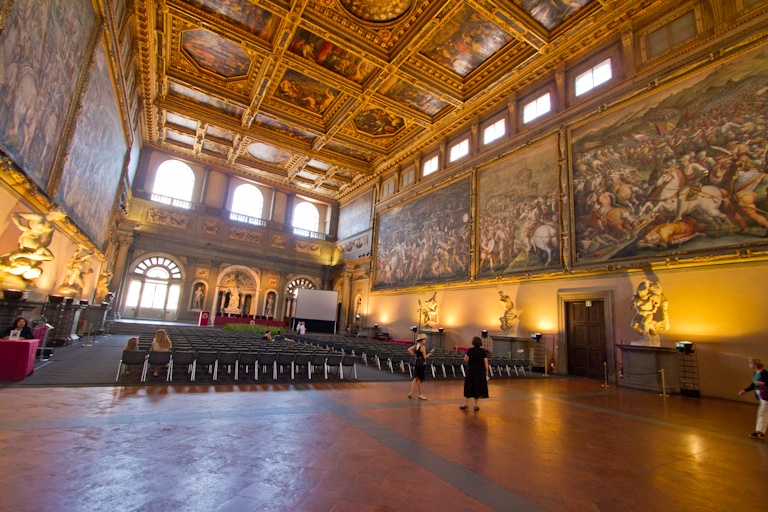 We still had a whole section of paintings left to see, but we mostly walked straight through all the rooms. It just doesn’t interest T and if we don’t know the story behind it or why it’s important, we just keep walking. 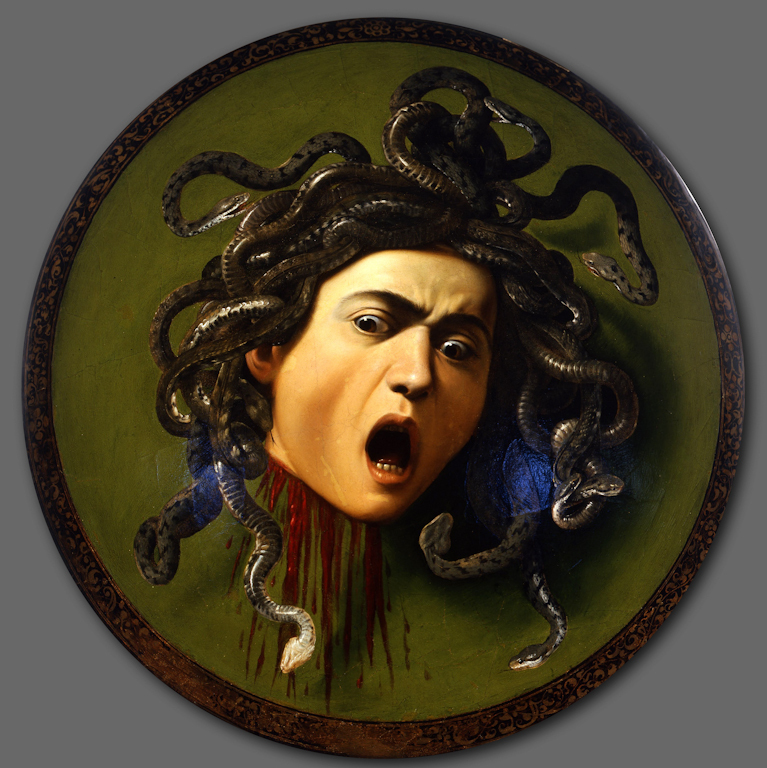 At the end were a few Caravaggio’s that we did look at. The Medusa head on the shield is a little creepy. Back to the hotel to chill for a little while after a long day of walking around. We’re trying to eat an earlier dinner so we can wind down sooner and fall asleep, thus getting up earlier the next day. 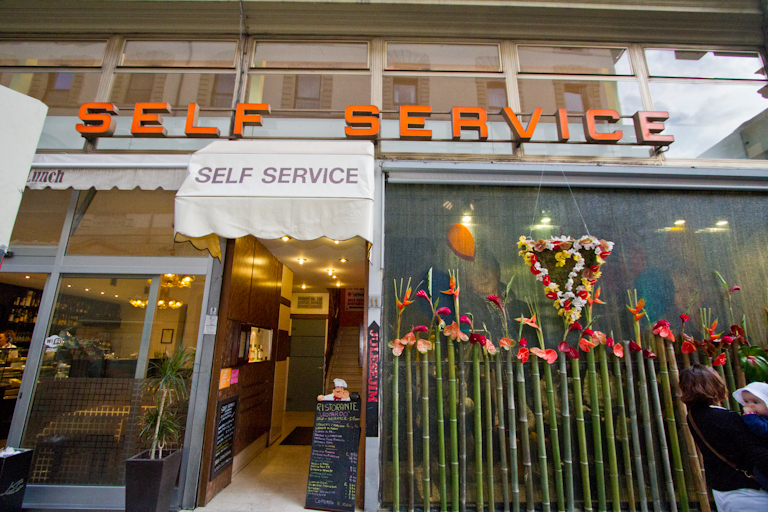 Wanting something quick and not sit down, we opted for a self serve place near the Duomo that got good reviews. T found tomatoes and cucumbers cut up on a plate and got those along with minestrone soup. I got tortellini in a white sauce with ham and a piece of bruschetta. Total here for both our meals was only 13.50 Euro. The nice man gave us a pitcher of water to take to the table with us and directed us to glasses (instead of the bottled water that costs money like all the other places). After our dinner, we decided to walk a little bit. 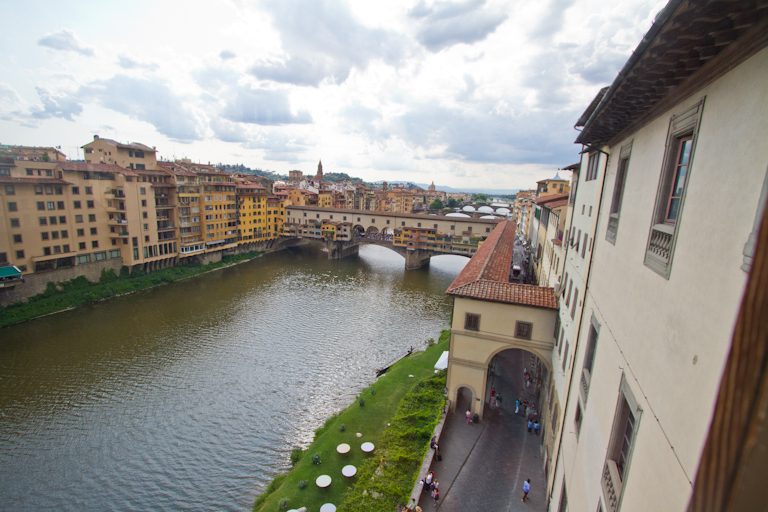 The Ponte Vecchio bridge is close by, so we headed that direction. 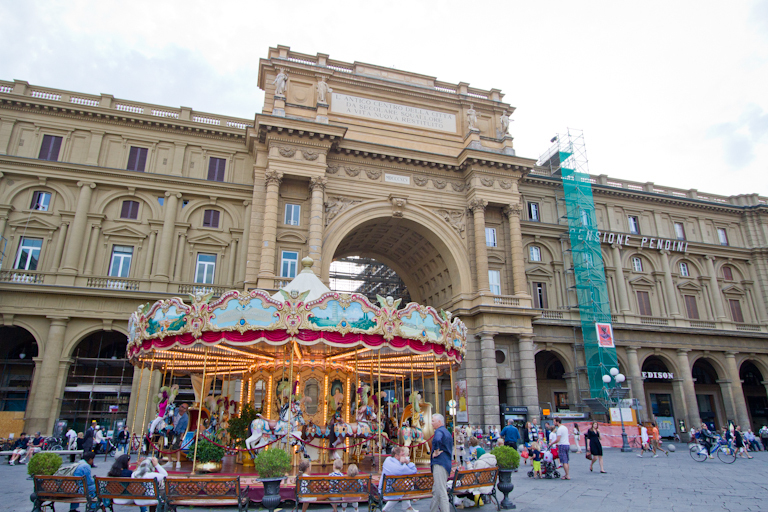 We passed a carrousel in a square on the way. 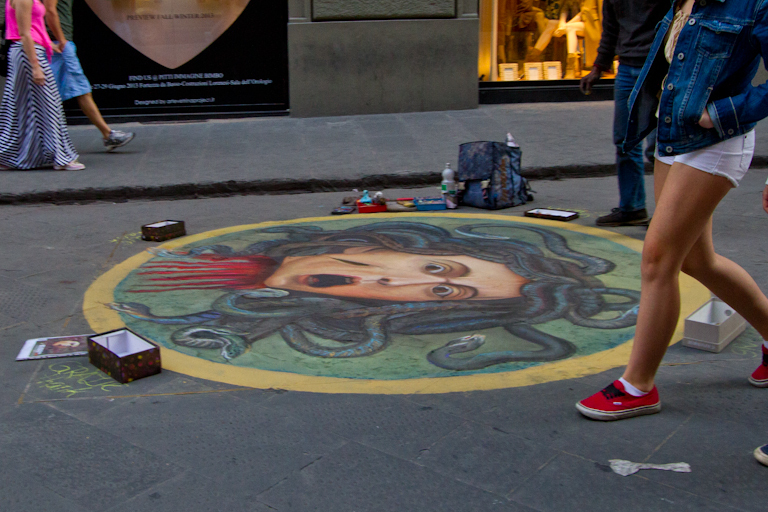 Also there were some chalk drawings of the Mona Lisa and the Medusa shield by Caravaggio in the street. Reminds me of the Pasadena chalk festival we were just at not long ago. 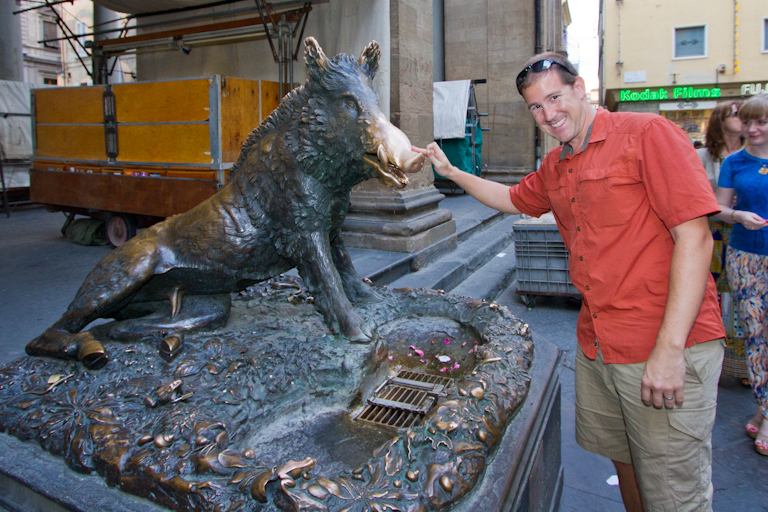 We also ran into the statue of Porcellino that is well known in Florence. 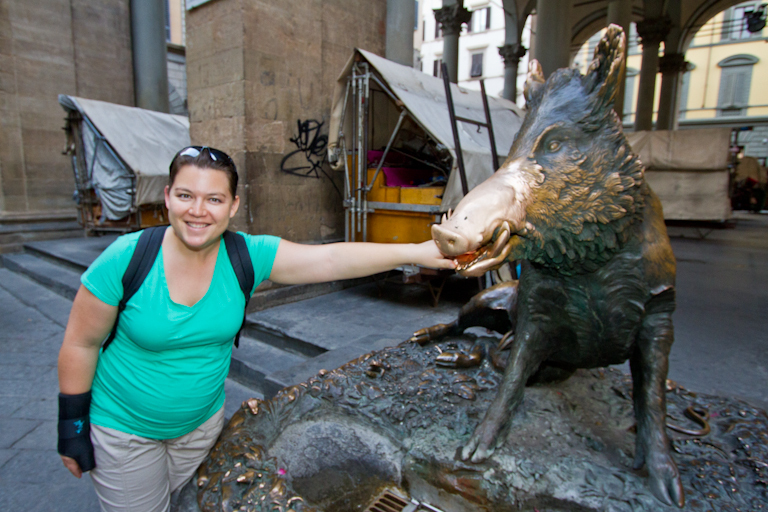 While in Rome, if you toss a coin over your shoulder into the Trevi Fountain, you’ll eventually find your way back to Rome, here in Florence they use a pig. 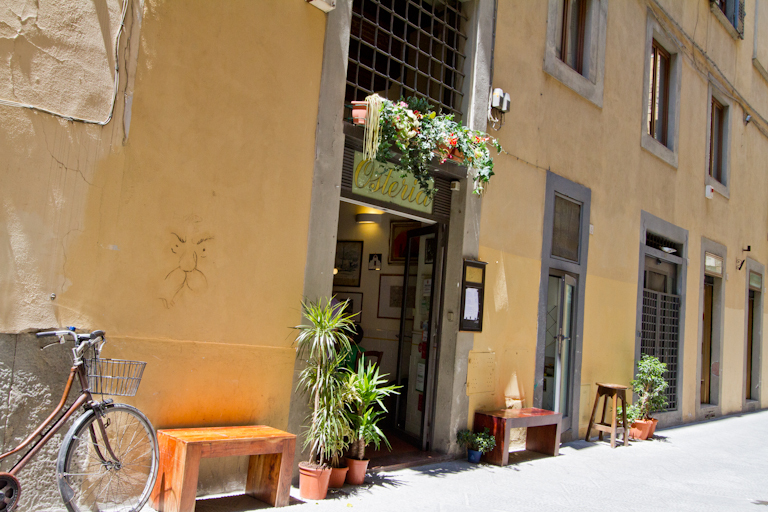 If you rub his snout, then you’ll be destined to come back to Florence. And even though this is a recent copy, you can see how there is a patina on the entire statue except for the nose where people have been rubbing. And if you put a coin in his mouth and let it fall into the grate below, you're destined to have good luck! 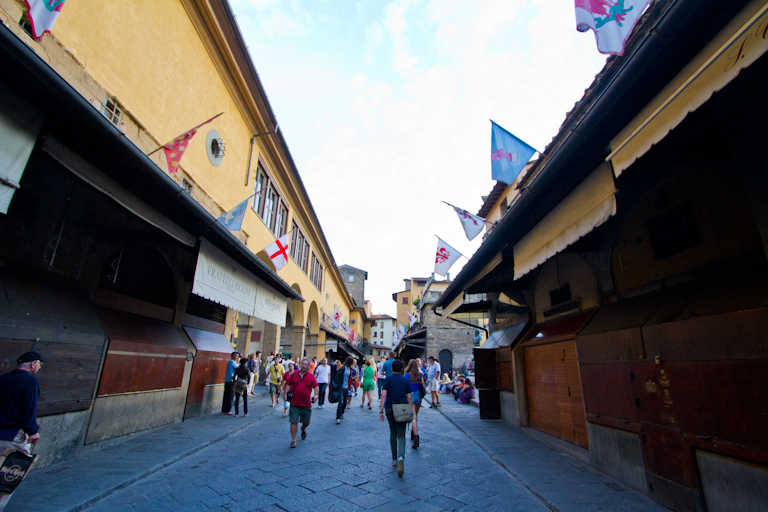 The Ponte Vecchio bridge is the oldest surviving bridge in Florence. All the others were bombed in the war. It used to be the place the butchers would have their markets and any scraps or whatever they didn’t want just got tossed into the Arno river below. When the stinky river became less popular with the locals, the gold and silver shops took it over. All the shops are closed at this time of the day though. 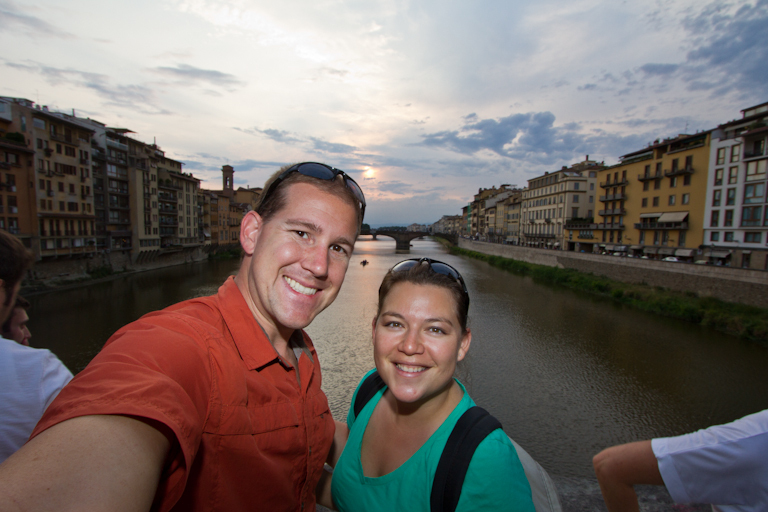 The sun is starting to set and we grabbed a few pictures on the bridge. 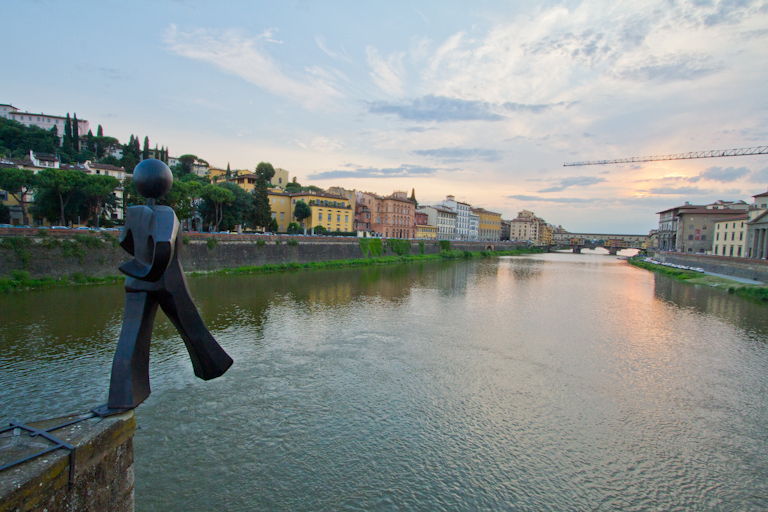 We crossed over into south Florence and walked to the bridge east of here, so we could see the sun setting behind the Ponte Vecchio bridge. 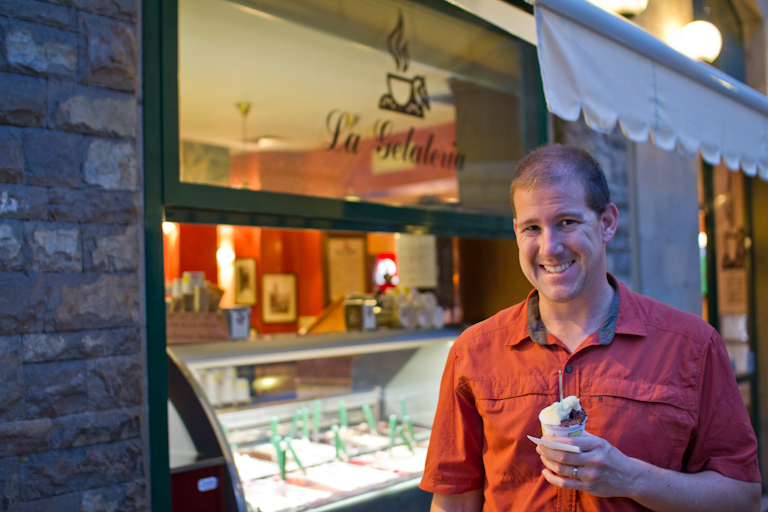 It’s time to get some gelati. 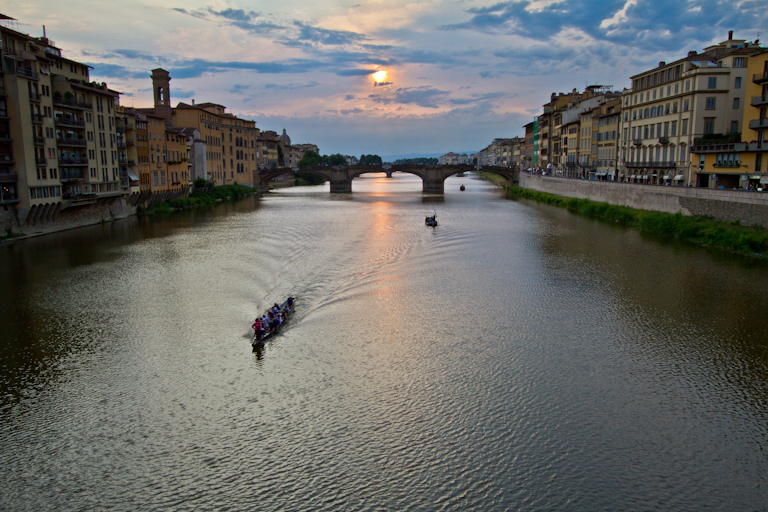 The closest one RS recommends is beside the Ponte Vecchio bridge. Seeing mint chocolate chip for the first time, T gets that. I get pineapple and chocolate. One bite of T’s and she’s doesn’t like it. Too much mint for her taste. She does seem to like my pineapple though, so we swap. A few more pictures in the square around our place and we’re in for the night. After showering, we start watching “The Three Musketeers” to get us prepared for France. It’s 1:30am and the morning will be coming soon!